I wanted to make something for the beach theme here at MTS, and since I haven't uploaded a lot here in a while, I decided to make a beach lot to share. But I didn't want to do a fancy, luxurious tropical beach lot. 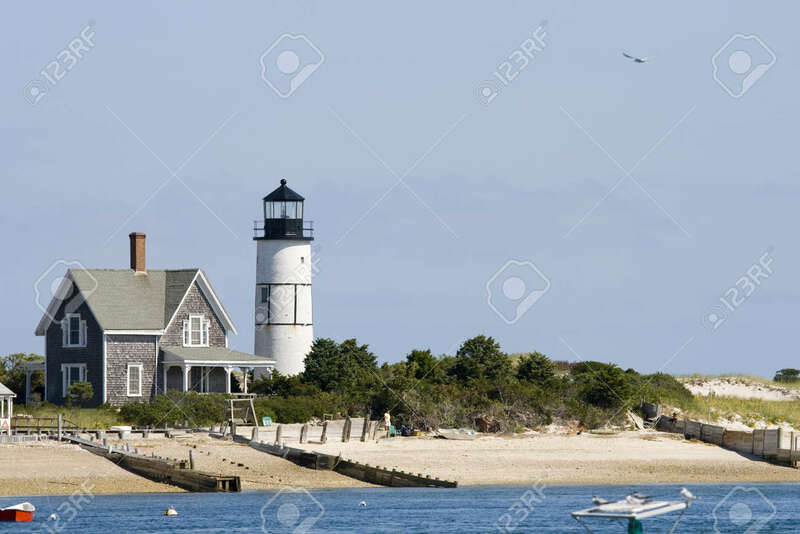 I wanted a modest and temperate beach lot, sort of like, for my fellow Americans, the kind you'd find in New England. (For the non-Americans -- and even for Americans who have no clue what I'm talking about -- such a place might look something like this. That was my "inspiration" pic. ) Basically, I wanted it to be sort of unkempt and overgrown in the back, very "natural," with the front a little more maintained. This is what I came up with. The house is small, sort of a traditional Colonial-esque style, which is fitting for my New England-esque theme. It has a very open ground floor, which contains the living area, dining area, kitchen, and a half-bath, with a fireplace in the living area. Off the back is a large-ish deck with a BBQ. Upstairs there are three decent-sized bedrooms, each with a designated spot for a closet/dresser. One is a master bedroom with an en-suite bath. There's an additional family bath, as well. There is also another empty 2x3 room up there which I will use as a laundry room, but which could be another bathroom if you so desire. If you do that, then with a little wall/door rearranging, you could give all three bedrooms en-suite bathrooms, if you like. The lot is unfurnished/undecorated except for walls/floors, kitchen counters and appliances, bathroom fixtures, and ceiling/wall lighting. It also has a phone. Otherwise, it's a blank canvas. 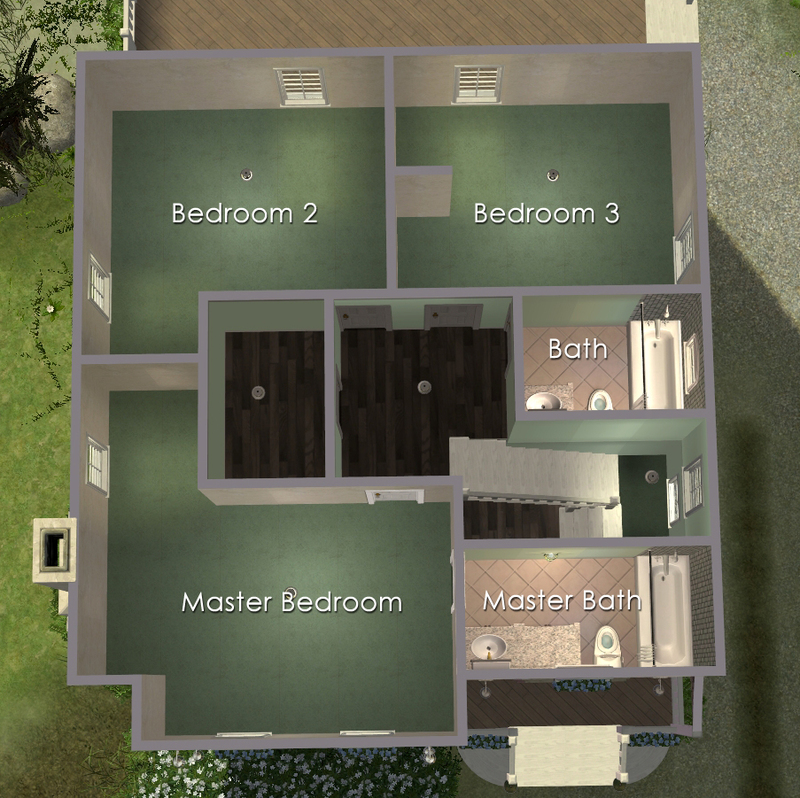 All of the buy mode stuff inside the house, except the tub/showers, is Maxis, just to keep the CC level down, and you'll probably want to pretty it all up with CC and stuff. EDIT! A person who downloaded this lot reported issues with the driveway on it. We determined that the cause of the issue is that I have Mootilda's Rotatable Driveway mod in my game and they did not. More details can be had in posts 7, 9, and 10 in the comments for this post. I apologize for this. If you do experience issues with the driveway, don't have that mod, and still want to use this lot, you might consider installing the rotatable driveway mod. The user who had a problem reported that doing so solved the issues they had. And now for the notes! There are always notes, when it comes to lots. Especially beach lots. 1) The lot has been shrunken horizontally to 2x5 using Mootilda's Lot Adjuster. 2) As built, it is also completely flat to the waterline, as you can see in the pic above. It was built on the Desiderata Valley terrain, in one of the spots along its little coastline, which I flattened in neighborhood view before I started building it. As a "test," once it was built, I experimented with placing it on other terrains in some of my neighborhoods, and it would generally place in spots that were pretty much flat and, of course, where an empty beach lot would normally place. So, I think it should be a little more flexible about placement than a lot of beach lots. 2.5) That said, this should definitely be noted: If you place this lot in an area that isn't already completely flat, then the lot will no longer be completely flat. This is because, unlike regular lots, a beach lot conforms to the terrain that it's placed on rather than making the terrain conform to it. This is why they are often difficult to place and why you'll sometimes end up with things underwater when they shouldn't be. So, should you want the lot to be completely flat as pictured and/or if you want to put it in a spot where it won't place "naturally," you will need to flatten the area that it will sit on while in neighborhood view BEFORE you place the lot. Vimpse wrote up a tutorial for how to do that (it is not hard at all, takes maybe a minute to do once you can do it without looking at the steps). She uses the same technique I figured out a while ago, which you can find here. You only have to follow through step 8. In short, if you flatten the terrain before you place the lot, then this lot will appear flat, and it should place on ANY flattened area that is also beach-lot compatible. 3) There is a metric buttload of landscaping outside -- trees, shrubs, rocks, all the way down to lots and lots of meshed grasses. 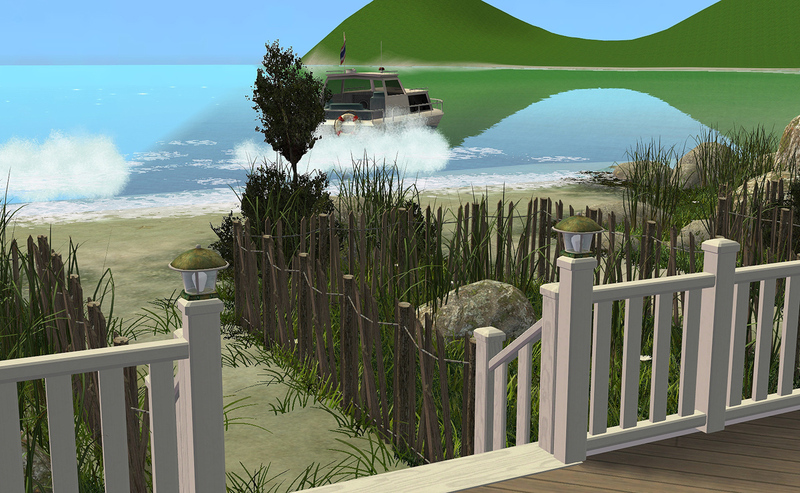 It is almost all CC because Maxis apparently thought that all beaches are tropical paradises with palm trees and spider lilies and apparently thought that we don't need grass in the game. I do not know if this will choke slower computers. It might. You tell me. Fortunately, none of it except three Maxis hydrangeas, all of which are Sim-accessible, will require maintenance. Otherwise, it will all maintain its lovely unkempt, overgrown state all by itself. 3.5) That said, Sims will attempt to smell some of the grasses because they were cloned from flower squares. On this lot, some of that grass is inaccessible, closed in with fences, so I would recommend getting a no-autonomous-flower-smelling mod, personally, if you do not already have one. 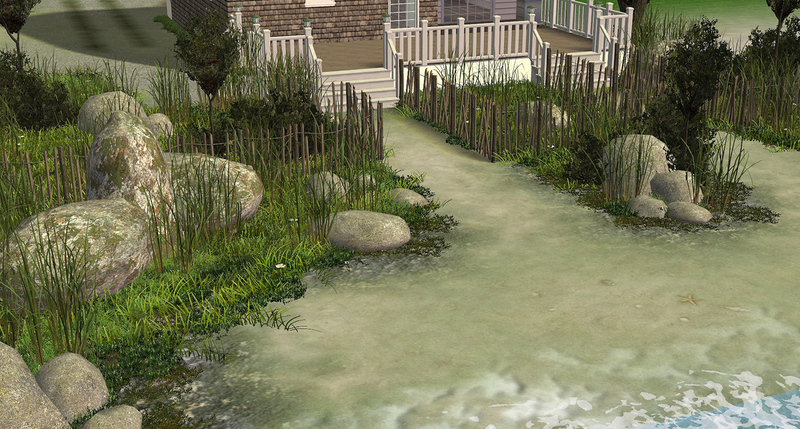 If you don't have/get such a mod, Sims on this lot will attempt to smell the grass. A lot. Because it will advertise to Fun pretty strongly. In any case, I did use the same things over and over, attempting to keep CC to a reasonable level. So, there's that. 4) The stairs inside the house are the open-underneath modular deck ones made by Reyn, which are linked to the recolorable version by Numenor. You need Numenor's recolorable version in your game for the open-underneath version to work, so that is also included in the package, in case you don't have it. 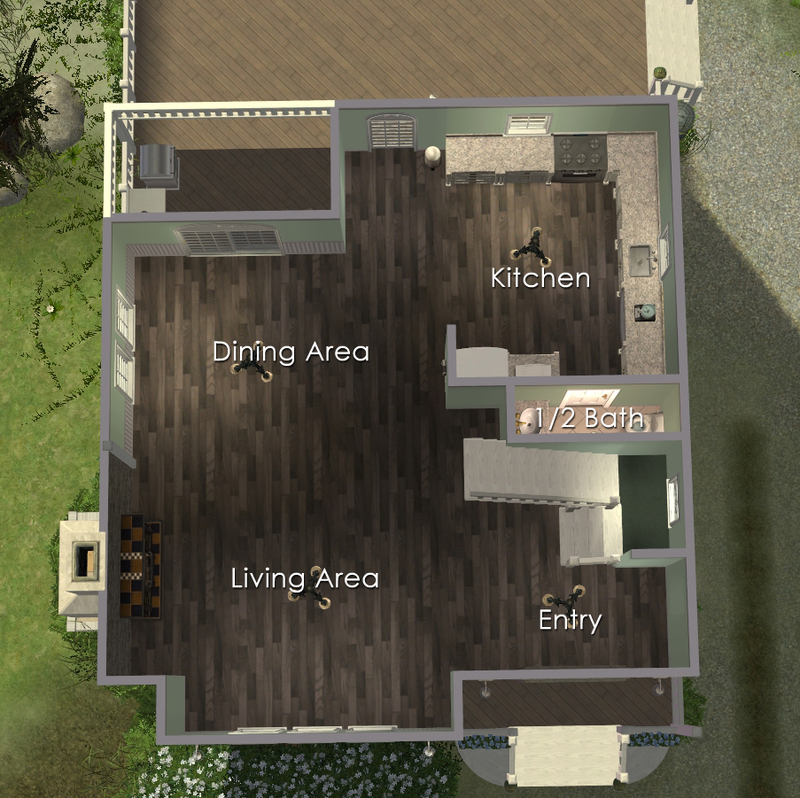 And if you want to use the open-underneath stairs on another lot and don't already have it, you'll need to get and install the script for them here. To be clear: You don't need to get/install the script if you just want these stairs to show on this lot, but you will need it if you want to use the stairs on other lots. 5) The front porch is small. If you put stuff on it or let newspapers accumulate, deliveries will start to be made to one of the back doors. I didn't want to make the front porch bigger because doing so would alter the look of the facade in a way that I didn't want. If this will bug you, feel free to make the porch bigger. 6) The truck and the decorative boat shown in the pictures are not included. 7) I have Phaenoh's white roof edge default replacement. If you don't, the roof edges will be the standard Maxis yellow-brown color. Yuck. 8) When you first enter the lot, one of the back doors and one of the interior doors upstairs will look odd. It's because they have other objects overlapping them. To fix it, make one change to the lot -- like moving some grass a bit -- save the lot, exit to the neighborhood, and then reenter the lot. If you don't do that, the doors in question will still work; they'll just look funny. 9) There is no invisible driveway/extension piece included. I figure pretty much everyone has one by now. Out of the box, the driveway pieces will be the standard Maxis concrete and will cover up the lovely tire tracks I painted. A copy of the lot has been play-tested rather extensively; the copy uploaded has never been occupied. Most of the CC is included in the package. 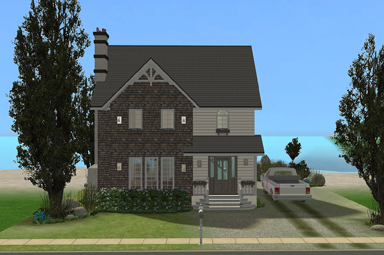 There are a couple of Maxis recolors and the master file for the gable decorations that are in a separate folder. If you don't install those files and don't already have them, the window boxes and the columns will be the wrong color, and the gable decorations will flash blue. Annnnnnnd I think that's all I have to say. Finally. 199 people have said thanks to iCad for this download.